Having a well trained and obedient dog has many benefits. It means that your dog will be happier, less disruptive, and fit in better with you and your family’s lifestyle. A dog that hasn’t been well training can however cause a lot of problems. Behavioral problems such as barking, digging, jumping up, running away, biting, destroying furniture, peeing inside, and hyperactivity can all be avoided by proper training of your dog. Some training tips provided below may help you make more progress with your dog training:Use rewards such as toys and food treats to encourage good behavior. Praise your dog when it does what you want it to. Slowly but surely this will teach your dog what is good behavior and what is not accepted. Training for dog from a young age will make the training easier. Old dogs CAN be taught new tricks but it will require more time and persistence. If you teach your dog the basics of obedience training from a young age it will learn much faster than leaving the teaching till it is no longer a puppy. Physical punishment of dogs for unacceptable behavior is generally not an effective way to train dog’s. This often causes confusion for the dog and may make the situation worse. Often when dogs are physically punished they don’t understand why, or they associate the punishment with another event meaning that instead of teaching the dog how to behave well, you are only confusing it. A better way to teach your dog when it is not behaving well is to simple ignore the dog, or do things the dog doesn’t like such as standing still when the dog is on the leash, or simply ignoring him. Another thing to avoid is to be too strict with your dog. Being too strict or overly commanding is frustrating for your dog. Spend good quality time with your dog to get to know him/her. This will benefit your relationship with your dog as well as your communication. 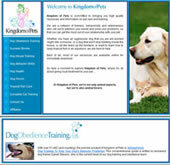 By enhancing the communication with your dog training will become a lot easier. Having an obedient dog can not only save a lot of time and frustration, it can also bring a lot of love and compassion to the relationship between you and your dog – it’s for these reasons that obedience training for dogs is so important. Eat your food first, your dog eats second. In the wild this is exactly what the lead dog does. Give your dog attention when you want to, not when your dog wants it. Don’t let your dog sleep in your bed. Allowing your dog to sleep with you puts him/her on equal terms with you – give your dog their own bed. Throughout this site you will find many articles about how to train your dog and how to properly care for your dog. We encourage you to read the articles and try to implement some of the tips and tricks mentioned. Remember, effective dog obedience training takes time and persistence. Even well trained dogs need reminding about how they should behave once in a while. Discover 5 Shocking Dog Training Secrets! 8 Essential Training Tips AND MUCH MORE!! !